Brief and Straightforward Guide: What is Graston Technique? by Tony F. Human, D.O. Are injuries behind Green Bay Packers outside linebacker Clay Matthews reduced sack numbers? Could Instrument Assisted Soft Tissue Mobilization Benefit Your Practice? Sacroiliac Joint Dysfunction: A common cause of low back pain? by Christopher D. Stromberg B.S., M.Ed., M.Ed., D.C. Peripheral Sensory Nerves: A Treatable Source of Pain? Disclaimer: All original artwork and content on this entire website are protected under law and require permission before any use. If there is an issue with any violation of use on this website, contact us and it will be resolved immediately. The top image is created by me using GT marketing stock photos and the layout design is protected. Please contact Graston Technique for the use of their stock photos. Please refer to http://fairuse.stanford.edu/Co... for more information. 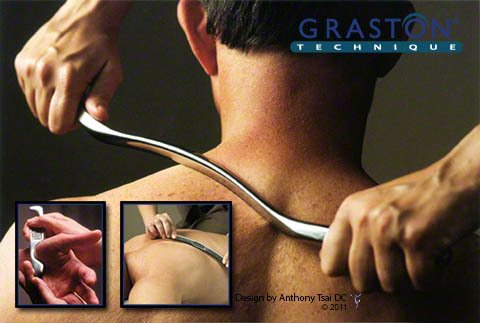 *Based on outcome studies & clinical experience, Graston Technique acheived quicker & better outcomes with acute & chronic conditions when compared to traditional therapies, and resolved injuries that have failed to respond to other therapies. For a reference for what this page is based on and more published articles, books and research reports, visit Graston Technique's website. Articles are posted on this site for informational purposes. All opinions expressed in these articles are solely those of the particular author and do not necessarily represent the opinions of not necessarily the opinion of ChiroWorks Care Center, Dr. Anthony Tsai, its employees, Graston Technique providers or affiliates. Any opinions of the author on the site are or have been rendered based on scientific facts and/or anecdotal evidence, under certain conditions, and subject to certain assumptions, and may not and should not be used or relied upon for any other purpose, including but not limited to for use in or in connection with any legal proceeding. "ChiroWorks Care Center" trademark #3,675,522. All rights reserved. This is my original design based on scanned photos with permissions for use from Graston Technique. I did everything I could think of to use this image on the web legally. Please don't use my image designs without my permission. Feel free to contact GT for their marketing stock photos.